Youghal Pipe Band are one of the longest existing pipe bands in Ireland. Founded in 1914 by Danny (Duis) McCarthy. On our website you will find here info on our History, a Gallery of pictures from past to present, a News section covering the latest news and topics about band recitals and outings, trips away and general news on the band. The Audio & Video page is a must with a gallery of video and a selection of audio files from past to present. We have an online Shop where you can support the band by purchasing a CD, book, t-shirt, mug or lapel pin badges. 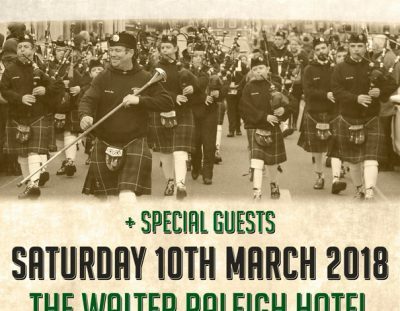 Youghal Pipe Band In Concert + Special Guests at the Walter Raleigh Hotel, Youghal Saturday 10th March 2018 at 8PM. We look forward to your support.